Noticeable changes have occurred over the past 30 years at Toolik Lake on Alaska's North Slope, the site of the Arctic Long-Term Ecological Research (LTER) project, as Dr. John Hobbie from the Marine Biological Laboratory in Woods Hole, Massachusetts, explains. Since the mid-1970s, Dr. John Hobbie from the Marine Biological Laboratory in Woods Hole, Massachusetts, has been travelling up to Alaska during the summer months to look at Arctic tundra and freshwater ecosystems near Toolik Lake in Alaska's North Slope region. Over the decades, Dr. Hobbie and his colleagues have noticed changes in the ecosystem at the Toolik Lake research site on Alaska's North Slope. 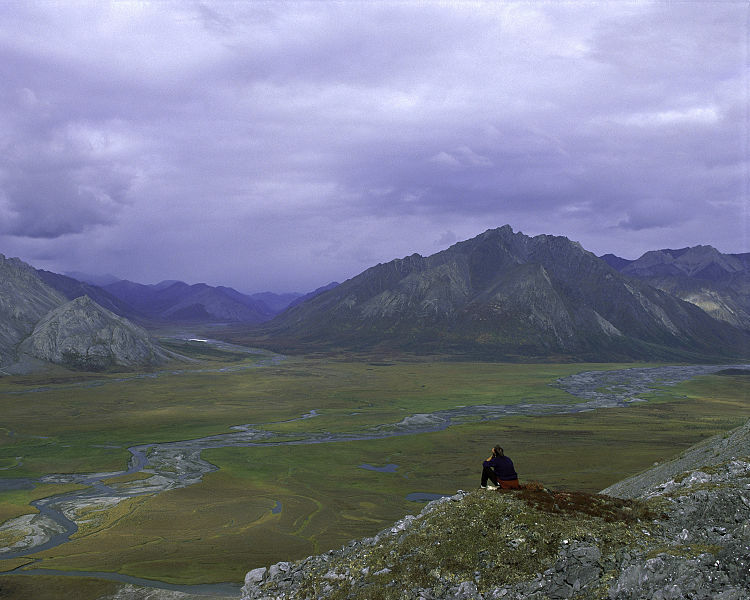 These changes include a deepening of the active layer of permafrost, increased thermokarsting, drying of the tundra and an increase in severe weather events such as thunderstorms, which had been unheard of in the Arctic until a few years ago. In this interview, Dr. Hobbie goes into detail about the gradual changes that have been taking place over the past 30 plus years in the Toolik Lake region and discusses what this means for the future of the Alaska's North Slope. What kind of research is being conducted under the Arctic LTER study? We're looking at what ecological processes are taking place, what the important controls of the processes are, and are predicting what the region is going to look like in 100 years. The Toolik Lake site is different from many research sites in the Arctic because of the combination of long-term monitoring, experimental manipulations, and variety of ecological and physical measurements being carried out. For example, we have been taking measurements in lakes near Toolik Lake for more than thirty years, longer than other projects in the Arctic. Also, many lakes have been studied around the Arctic to document the amount of nutrients and the species of algae, zooplankton, and fish; however, the Arctic LTER project also measures ecological processes, such as the feeding rates of zooplankton and growth of algae and fish, and controls of the processes. This research on the controls of processes is carried out by conducting small laboratory experiments and also by adding nutrients to entire lakes or removing or adding fish in lakes to see the effect of these changes on whole ecosystems. So we're looking at land, lake and stream ecosystems. All three are interconnected because minerals and nutrients from the soil eventually move into streams, which in turn eventually flow into lakes. What have been some of your observations? The climate system at Toolik Lake normally has a yearly average temperature of about -10°C. The site has been warming slightly, although most of that warming has been taking place in the wintertime. So far there have been no dramatic changes; however some very slow, gradual changes have been happening. At the Toolik Lake site the permafrost down 20 metres is still pretty cold. It's about -5°C. So the permafrost isn't thawing on a massive scale. But we are seeing more thermokarst forming (pockmarked land surface which results from the melting of the ice contained in the permafrost), which means you'll often see the ground collapse in certain places. It appears to be happening a little faster and more intensely than before. But the permafrost has warmed up over the 15 years. The total change in temperature has been about 0.7°C, and about half of this change appears to be due to more snow (when there's more snow on the ground, soil temperatures are warmer because the layer of snow creates insulation), and the other half of that change is due to warmer temperatures during the winter. This has led to the active layer above the permafrost expanding by a few millimetres, which doesn't sound like much, but over time the expansion of the active layer will have effects on the ecosystem such as increased plant root growth and increased amounts of nutrients entering soils, streams and lakes. However change in permafrost depth is not something we can measure directly down to the millimetre level. How can you measure how much the active layer of permafrost has expanded? We use the increase in stream alkalinity as a proxy. Overall we've been seeing a doubling of the alkalinity of the streams entering and leaving Toolik Lake. Basically we see how much the active layer of permafrost would need to increase in order to arrive at a certain increase in alkalinity in the streams. This is likely due to an increase in the mineral matter in the soil breaking down as the permafrost thaws and the thawed soil becomes weathered. We're talking about soils that have been frozen for 10,000 years - since the last glaciation basically - and now the breakdown of these newly liberated minerals is making the streams more alkaline. We can also examine changes in the ratio of two strontium isotopes coming into the lake. This can also help us estimate just where the minerals in the soil and stream waters are coming from. The lighter isotope of strontium is becoming more abundant in the runoff and it is also more abundant in the deeper soils. Has the thawing permafrost been having other noticeable effects? The overall vegetation on the tundra has been increasing as increased levels of nutrients are released from the permafrost as it both warms and thaws. We do nutrient studies because as the climate warms, the soil processes act faster, making more nitrogen and phosphate available. Having more nutrients available will ultimately change nutrient cycles. We've done whole system experiments over 25 years in our streams by adding some small amounts of nutrients, such as 10 parts per billion (ppb) of phosphate and we've seen a very dramatic change over time in the biota in the streams. After nine years the mosses took over, crowding out the algae such as diatoms, then this leads to large changes in the insect population and the growth of fish. Of course it all depends on how fast the thaw happens and how many nutrients reach the streams whether or not this will affect the fish populations. We've also seen the tundra become more "shrubby". Shrubs have always been present on the tundra, only now they're becoming a little more dominant, and we believe this is also due to additional nutrients getting into the soil water from the thawing soils and from the microbial response to warming. We've been conducting experiments where we heat the soil and/or add nutrients to a test tundra ecosystem to accelerate the changes, and we've seen characteristic tundra plant growth really take off. Some of the plants such as the dwarf birch go from an average height of about 20 centimetres to about 2 metres. But this is not going to happen right away. Our measurements of these whole ecosystem changes approximate what we think is going to happen over the next 100 - 200 years. What kinds of predictions can you make at this point about how the climate in this region will be affected in the long run? The number of extreme weather events such as droughts and periods of heavy rainfall will likely increase. There are thunderstorms in the Arctic now. When I started working in the Arctic in the 1950s experts told me that there were never any thunderstorms in the Arctic, or even cumulous clouds for that matter. This is no longer the case. And the number of lightning strikes in the Arctic has dramatically increased over the last decade. The Bureau of Arctic Management monitors and records the location of every lighting strike across the whole State of Alaska. Their records go back to 1980, and since then there has been a dramatic increase in the number of lighting strikes; on the North Slope, the number of lightning strikes per year increased 10 times over the last ten years. A coupling of a severe drought in the summer of 2007 and lighting strikes ended up causing a very large fire 1,000 km2 in area. This was the first time in recorded history that there had ever been a large fire in the Arctic part of Alaska. And it happened on the tundra. We'd always assumed that the tundra was too wet to burn, but the fire ended up burning for two months. Thankfully being a low tundra fire, as soon as it encountered a stream or river, its progression stopped. Now we're studying this post-fire ecosystem. There have been tremendous changes in the amount of carbon dioxide entering the air, the radiation budget, the rate at which the soil is warming and the thickening of the active layer of permafrost. In areas where the fire was light there has been a lot of re-growth of tussocks. But in areas where the fire was very intense, it burned right down to the soil, so the vegetation was completely wiped out. The burn area was so bad you could even see it from satellite images. Have there ever been any fires of this magnitude so far north? I can't really speak for the rest of the Arctic; I can only speak for the North Slope. There had been small fires up there before. But the fire we had in 2007 was ten times bigger than anything we'd ever seen. We didn't see any fires at all in our 30 years of research in the region until 2004 when there was a small fire, which burned itself out in day. But the big fire of 2007, which burned for about two months, was the biggest fire in the state that year. So are there significant changes in store for northern Alaska? We know for sure there's going to be more thermokarsting and the whole ecosystem will become drier as the active layer of permafrost becomes deeper, leading to easier drainage of water (right now the permafrost creates a seal that prevents excessive drainage). So the northern part of Alaska will change from having an ecosystem that has been stable for the last 10,000 years to becoming much more like the central part of Alaska where there are massive fires every 80-100 years. There will basically be a restructuring of the whole ecosystem over the next 100 years or so - at least on the landscape level. Are you saying that there will be a northward shift in ecosystems? It's hard to say exactly, but I do think there will be a northward shift in the distribution areas of plants and animals. However at this point we haven't measured any significant changes on this front. We're just starting to get a handle on the micro-organisms and the fungi, which are a very big part of the ecosystem, and we have very little information even on what species there are. We've been studying the process by which micro-organisms decompose organic matter. But as far as investigating which species are present, we only started looking at this 15 years ago. But now we're doing a lot more with figuring out what kinds of microorganisms are out there. Have you spent much time investigating how animal species will be affected? The US Fish and Wildlife Service generally takes care of that. They do things like put radio tags on caribou and then use satellites to track their movements. But if you're looking exclusively at models of vegetation it doesn't make much difference whether you include or exclude animals in the models. If the dwarf birch eventually comes to dominate the terrain in certain areas, we might see caribou herds change their migration patterns to avoid these areas, since they don't like the large amounts of resin in the small branches and on the leaves. And we've studied fish. The 2007 summer drought for example killed off large numbers of arctic grayling, which is a river fish. The drought dried up the streams so much that the grayling couldn't get back up to the headwater lakes where they over-winter. We lost about 7000-8000 the winter following the drought. Are you expecting to see more droughts in the area? There's no solid evidence to suggest this. The parts of the climate models for the Arctic Region that look at precipitation are probably the least robust sections of the models. The scale at which the climate models work are not yet able to factor in the weather patterns on as scale to be able to predict drought. If the Arctic Ocean is having an impact on the weather patterns in northern Alaska it hasn't shown up in the modelling yet. A researcher at the Marine Biological Laboratory in Woods Hole, Massachusetts, John Hobbie is interested in the role natural assemblages of microbes play in ecosystems. He has been involved in the Arctic Long-Term Ecological Research (LTER) network since the 1970s. The LTER network comprises 26 collaborative projects in which researchers are monitoring a variety of ecosystems in the U.S., the Antarctic, and a Pacific coral reef. More than 1,800 scientists and students are taking part in these research projects.